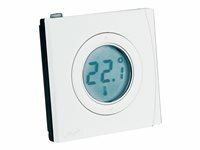 This Schwaiger room thermostat provides your individual feel-good temperature. It is not controlled directly on the radiator but from wherever you are. Thanks to easy wall installation, the sensor can be installed anywhere in the house.